So after I got through whining about my fusible web tracing issues from yesterday, I went back to the studio to try again. THis time I managed to get it right. I’m making this piece up as I go along, so once the letters were fused, and I did a quick zig-zag in matching thread, I had to decide what was next. Figured it couldn’t hurt to try. I had this red bead mix that is packed with various shades of red (true red, pinky-red, purpley-red, goldish red, matte, shiny, silver-lined, clear). 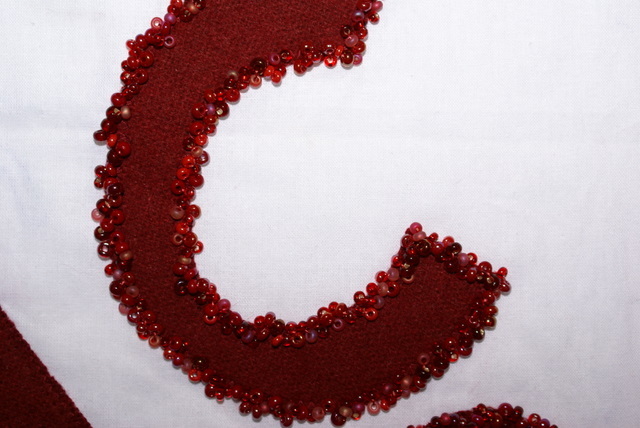 So, I started picking up groups of 2 or 3 beads (stab the needle in, whatever comes out on the needle is what gets sewn on), and began outlining the Q. Between last night and this afternoon, I’ve got the “C” and the “Q” outlined. Don’t know what exactly I’m going to do with the all of the plain white fabric in the rest of the block, but I’m sure I’ll come up with something. Maybe more beads. 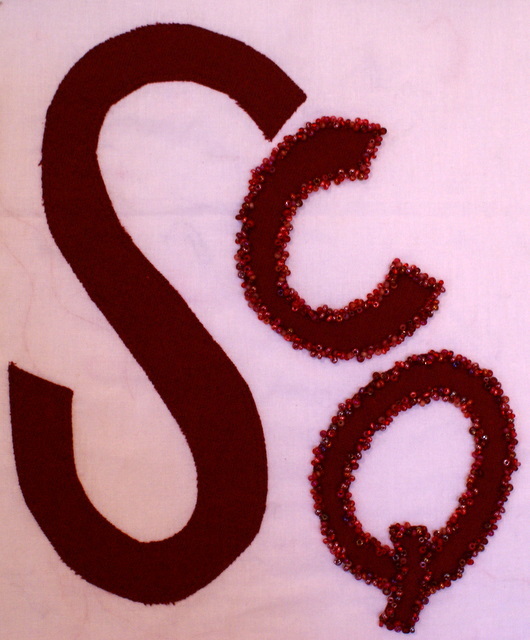 In case you are wondering, Salt Creek Quilt Company is the name of my business, thus the reason for the letters. I think I need more beads. Anybody want to share their favorite bead source(s)? Cool! I like how it’s turning out. I don’t buy many beads online. I mostly buy them at shows. We have a big bead show here twice a year and most quilt shows have a few bead vendors now. I have more than I need for a while! I see something black – beads? stitching? paint? in the background. But then, I always see black and red together! Not very imaginative!